Plot: Bob Parr (Mr. Incredible) is left to care for the kids while Helen (Elastigirl) is out saving the world. Starring: Craig T. Nelson, Holly Hunter, Sarah Vowell, Huck Milner. 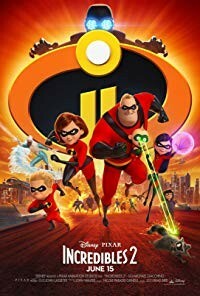 distributed by Buena Vista «The Incredibles 2» in the US movie theaters released on June 15, 2018 and has grossed over $1,1 billion worldwide; dvd and blu-ray release date was set for November 6, 2018. Rent from Netflix and Redbox from November 9, 2018. «The Incredibles 2» in the UK released in movie theaters on July 13, 2018. The movie released on dvd and blu-ray on November 12, 2018.